Do a Soul Map instead. It’s more fun and creative. And you can tap into your inner wisdom to create a map that aligns with your souls calling. It’s also a great way to get rid of anxiety because you have a map of your values, work themes that get you excited, and projects you passionately want to work on. I hate planning and goal setting. The intellect-driven process drains my energy. I end up with a whole lot of shoulds that I don’t feel inspired about. And if I don’t have intentions and a map, I get way too unfocused and work on too many ideas and projects without completing anything. I’m highly innovative and creative, and can get lost in my overflowing stream of ideas. So, I’ve created a soul map to guide me through 2019. Below I’ll show you how to create one for yourself. Get out a sheet of paper of any size and colorful markers or pencils. I like Sharpies. The inner circle has my top 5 values: Self Love, Wisdom, Truth, Excellence, and Joy. These values are my guiding stars and also litmus test when I need to make a decision. Am I demonstrating Self Love in this decision? Am I exercising my highest wisdom? Does this path feel true to me? Will I be demonstrating personal excellence? Will doing this bring me joy? I searched for an overarching theme that pulls all of my values together and it is: Self-Agency. I believe that when I am operating from a place of Self Agency, I am living all of these values. When I look back at my career since I took charge of it and became a solopreneur in 1999, I can pull out three major themes of my work that are emerging: Self Directed Education, Expanding Consciousness, and Soul Nurturing Relationships. I only want to work on projects that are in alignment with these three broad themes. 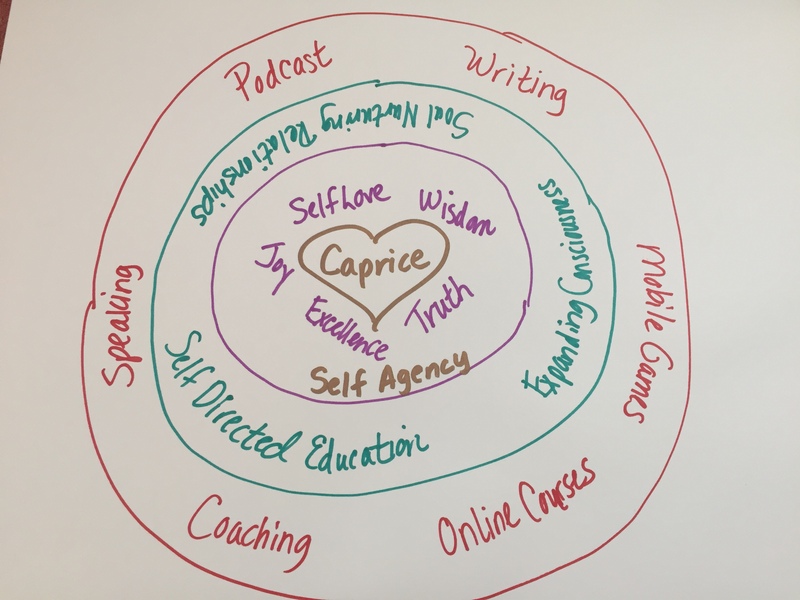 Finally, the outer circle shows the projects that I am working on in 2019: I’m launching a podcast, writing a book (I’ll post chapter by chapter on my blog), refining and marketing several online courses I’ve developed, expanding my coaching practice, doing more speaking, and getting Joyful Action Media funded to produce mobile games that help young women avoid abusers and predators as they learn how to find good men. I invite you to do a 2019 Soul Map for yourself, take a picture, and share it with me on Instagram.